90% of Americans do not enjoy cooking. In fact, the average American eats out between 4 and 5 times per week. (www.hbr.org) (www.thesimpledollar.com) This is a troubling statistic, because cooking fresh foods at home is healthier and less expensive than eating at restaurants. In addition, research says that eating healthy foods like fruits, vegetables, lean proteins, and whole grains as a young child are tied to what experts call Upstream Determinants of Health. In simple terms, the healthful choices made today have an impact on a person’s health in the future. 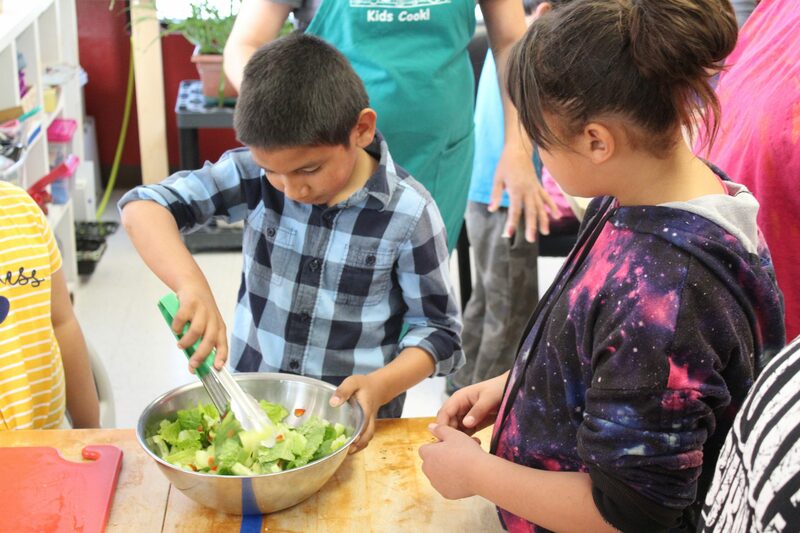 Taking a proactive approach to better health, Adelante’s Wellness Referral Center is working with local medical providers to connect local families to Let’s Cook cooking classes. A doctor or provider lets Adelante know a particular family would benefit from the cooking classes, and Adelante’s Wellness Referral Center contacts the family and helps them enroll. One cooking course Adelante connects families to is called Kids Cook, which is a multicultural and experiential food education program targeting elementary and middle school students. Their motto is “Eat food, real food, with variety and moderation.” Kids learn about nutritious foods, etiquette, cooking, kitchen safety, and sanitation through hands-on lessons. Let’s Cook focuses on family participation, but individuals are welcome, too. For example, people with disabilities who take part in Adelante’s Independent Living program joined in on the learning in late March. Kids learn about healthy food through hands-on culinary experience. All skill levels are welcomed. One mother mentioned that her daughters love to help her in the kitchen. Another taught her kids how to flour their hands when making dough. Successful participation is just a matter of being willing to further your learning. Eating well doesn’t mean eating bland foods. Let’s Cook takes healthy eating to a whole different level through making wholesome, culturally diverse meals without sacrificing flavor. 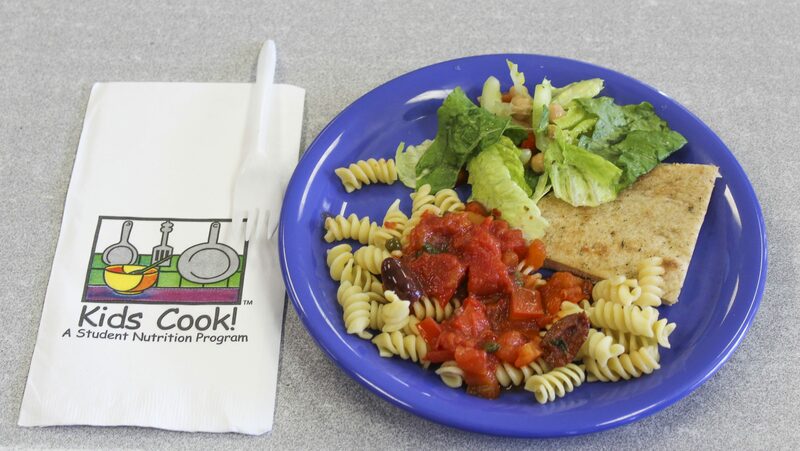 The Mediterranean dishes in a recent class included skillet bread with Za’atar seasoning and rotini pasta with a balsamic tomato sauce and Kalamata olives, along with recipes from India, Peru, and the Southwest. Rotini with tomatoes, capers and Kalamata olives; Mediterranean salad; and skillet bread with za’atar seasoning. 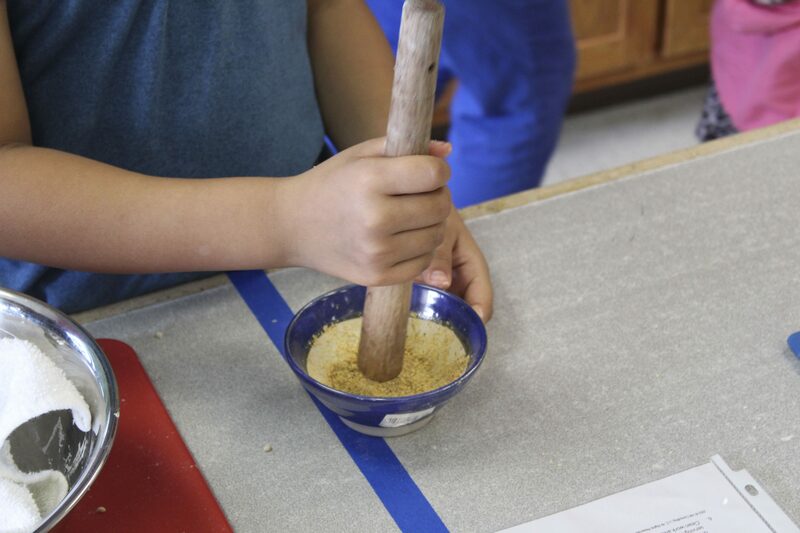 Grinding up herbs with a mortar and pestle is one of the unique skills families learn. Kids Cook students may initially be hesitant about trying new foods, but teaching cooking skills and healthy eating broadens their horizons. “One thing I notice is how big of a change there is with the kids,” said Aida. “When they start their class in the beginning, the boys tell me ‘this part is for girls; I don’t want to cook.’ And by the end of the class they’re asking me ‘can I help with this part?’ When we tell the students this is the last class—they all say: ‘Oh no!’ They’re so sad.” Many students and parents ask for recipes, and participants do receive a booklet of the recipes at the end of the classes. Kids Cook does not use meat in their recipes during classes, primarily due to safety concerns with young learners. They also can modify recipes and substitute ingredients if a student is vegan or has a food allergy. While the class interviewed for this article took place in Valencia County, Kids Cook also hosts Let’s Cook classes the first Friday of every month in Albuquerque. The cooking classes and other upstream health ‘prescriptions’ such as exercise are a benefit to both individual and family health, but there are other incentives, as well. The Wellness Referral Center holds drawings every quarter for people who follow through with the classes or exercise their medical provider has recommended, so participants can win prizes and rewards, too. Adelante greatly appreciates Presbyterian Healthcare Services and the CDC REACH program for sponsoring the Well Referral Center to make programs like these happen in New Mexico. If you want to take steps toward eating healthier, or you are interested in learning more about Kids Cook! Or Let’s Cook classes, contact Adelante’s Wellness Center by calling (505)445-5332 or email info@wellnessreferralcenter.com.